Where will you hide your latest scores? Shopping Day download pattern is a 19 page PDF file you download and print on your home printer. 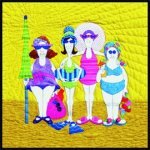 The Shopping Day pattern includes instructions, patterns, & placement sheet to make the 20" x 28" quilt.